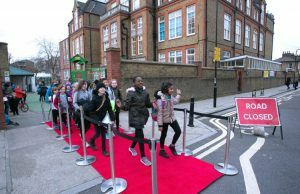 Dianne Abbot, MP for Hackney North and Stoke Newington, visited children at Millfields Primary to mark their launch of the Hackney School Streets scheme, part of the council’s attempts to create “a more pleasant area environment for everyone”. The scheme, first trialled outside St John the Baptist’s school on June 26 2017, stops vehicles from entering streets around schools during their opening and closing times. It aims to make the school run more enjoyable for everyone involved, reducing pollution and congestion, and giving children a place to play. Vicky Noakes, assistant headteacher at Millfields, said: “The majority of local residents, many of which are our families, came to our consultation meetings and are backing the scheme. 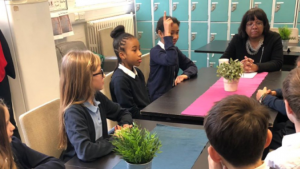 Millfields is now the third Hackney school to be involved in the scheme, following Gayhurst Community earlier in the week (on February 1 2018). 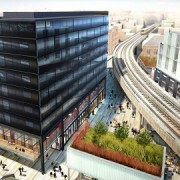 Two more Hackney schools (Tyssen Community and London Fields Primary) are planning to join the trial later in the year. Over the coming months, the council plans to take air quality readings in the closed-off areas, monitoring how much of a difference is made to a child’s intake of harmful pollutants. Air pollution in Hackney poses a significant problem. 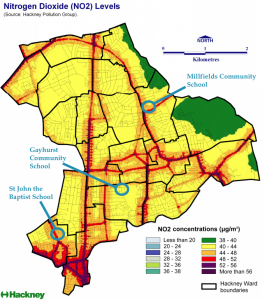 Studies conducted prior to the introduction of Hackney School Streets, show the average nitrogen dioxide concentration on all roads surrounding schools taking part in the scheme, exceeded the EU legal limit of 40 micrograms per metre cubed. Studies have shown that levels of nitrogen dioxide this high are particularly damaging to children. Exposure can worsen existing breathing conditions such as asthma, and even predispose healthy children to repeated chest infections in the future. Drivers entering the areas without exemption permit will be identified by cameras, and will incur a fixed penalty notice. The scheme is an expansion on the ‘Hackney Play Streets’ initiative, introduced in 2012. Play Streets allows residents to apply for temporary road closures around their homes, creating safe, communal, play areas for local children. Research out of the University of the University of Bristol in June 2017, shows the benefits of open streets on communities. Communities taking part in the observed schemes reported boosts in overall happiness, and said their areas felt not just safer and cleaner, but friendlier and more united. Regarding the article ‘School Streets scheme spreads to two more Hackney schools’ – as a Hackney / Rushmore Road resident, I have not been consulted or asked for my opinion on the impact of this scheme by either the school or the by Hackney Council prior to it being implemented . I have now received 2 penalty charge notices for driving through the ‘school zone’. I am disgusted at the way this scheme has been enforced, particularly as a resident living in the area and having to use these roads for travel to and from work. I already pay taxes for living in the area, road tax and have to pay to service and MOT my car to ensure it is roadworthy and has clean emissions as legislated by the Government, yet as a resident I am restricted to travel and use the road during the times. I agree this scheme should minimise traffic from non-residents, but doesn’t justify penalising residents like myself i the area.